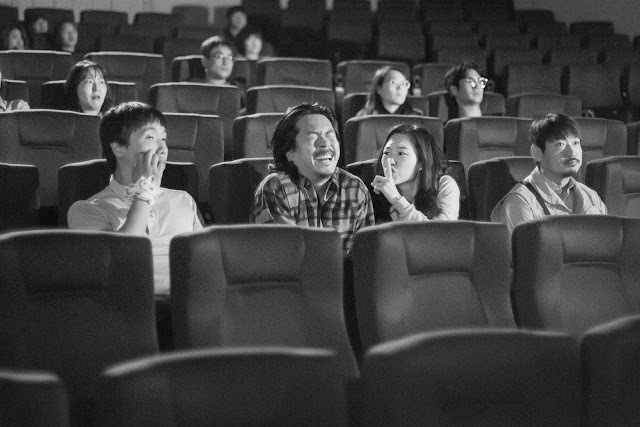 Focusing on a whimsical, almost-dead pan rom-com narrative, Zhang Lu's "A Quiet Dream" investigates the quotidian lives of a group of people living in the poorer suburbs of Seoul. Shot in black-and-white and occasionally boosting a melancholic undertone, the film follows people who had to cope up with their social and geographical displacement only to live a life that doesn't echo with their dreams. 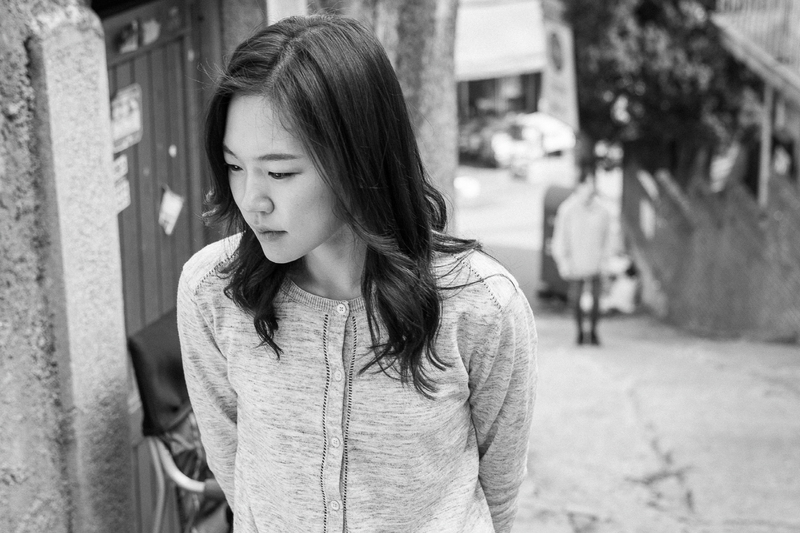 Pivoting around Ye-ri (Han Ye-ri), a young woman who moved from China to Seoul when her mother died of cancer; the film follows her and the three male friends as they hang out at her street-tent bar outside her apartment. 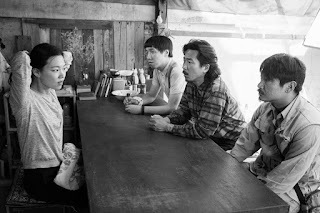 The three men are Jung-bum (Park Jung-bum), a former North Korean defector presently dealing with being fired for having 'sad eyes', Jong-bin (Yoon Jong-bin), an epileptic milk-sipping guy who owns Ye-ri's place and Ik -june (Yang Ik-june), an ex-gang member who was thrown out for laughing at a member's funeral. The narrative of Lu Zhang's film is almost lyrical, that is, even in its tragic moments, the film has a touch of opaque beauty to it. Often reminiscent to Jim Jarmusch's "Paterson" (strictly based on the quotidian lifestyle presented in both the films), the film expertly crafts a slice of floating life around three misfits obsessing over the same woman. While they keep each other away from her, the very fact also brings them together. Ye-ri, on the other hand, doesn't really pick any of them to be the suitor either, but it goes to show that she needs them more than they need her. Having been forced to take care of a paralysed father, Ye-ri seems to be stuck in a kind of puddle that has left no choice for her. We see her watching art-house films, reading poetry and dreaming about mountains she would have climbed, which tells us that her dreams are of far off places. It also tells us that she is, in a way, trapped in the environment she lives in. The beauty of the film lies in the perfect bond that the 4 characters share with each other. The need for companionship and sharing lives with people who truly care forms the crux of Zhang Lu's film. Their random walks, their drinking and the endless thread of insults fill the film with subtle humour and real moments of joy and melancholia. There's also a low-key jibe into the essence of art-house cinema where the trio along with Ye-ri watches a film. A person is seen peeling eggs for over a minute as one of them bursts into laughter. I think Zhang Lu is also criticising the way films, especially the art-house films, are perceived widely. The editing of the film is truly experimental, especially towards the end. There are also bold choices where the film cuts off from the narrative to a tomboy with a football. It could have easily felt forced, but it somehow fixates us even more to the men's obsession with Ye-ri who isn't the traditional beauty seen in most films. After reading into Zhang Lu's film, I also stumbled onto the interesting fact that the three men in the film play versions of their own characters in their previous films (all of them being acclaimed Korean directors). I don't know if that's a nice little homage or in fact a manifestation of Lu Zhang's dream after truly appreciating their respective films. The title card of the film appears after almost half an hour into the movie, and it instantly changes the way you perceive the film. A dreamlike haze thus surrounds this slice of life film and you start to questions the profoundness that Zhang is trying to portray. The camerawork often hovers off the various characters making the audience a 5th element of the group. It makes you more vulnerable when they are at gunpoint or sad when the fortune teller can't predict anything about an eventual escape from dreams into a reality. A reality where they are not brought down to the same roads that lead you to the same place, over and over again. With minimalised visual motifs, realistic humour and an ideal social comment without consuming the characters into exaggerated self-pity, "A Quiet Dream" becomes a lyrical ode to everyday people. This ponderous comedy about misfits resonates deeply when you are willing to consider dreams as part of reality and reality as part of dreams.